Whistleblower Banker: "All Misery on Earth is a Business Model"
A former elite international banker-turned-whistleblower has come out to give humanity a super dose of reality about how the world is run and how we can beat it. 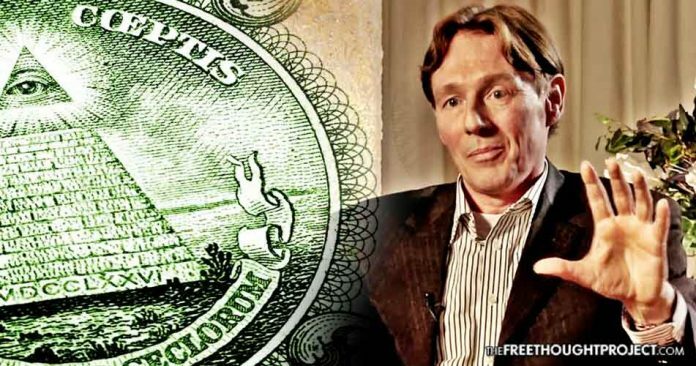 In April, the Free Thought Project reported on Ronald Bernard, who is a Dutch entrepreneur whose drive and business contacts quickly catapulted him into the world of the financial elite. In his April interview, Bernard touched on the horrifying things he saw as a member of these elite groups. But now he’s going even further. While his interview De Vrije Media in April touched on the utterly murderous and insane practices of the elite, a new interview released this month goes much deeper. In the second interview, Bernard explains how and why the ruling class are able to maintain this control, while committing horrid crimes, and while extracting wealth from the citizens through unscrupulous and illegal means, all the while maintaining immunity from the law. They’re “like a bunch of vampires, that is what it is. In 20 years they already stole 100% of the real value. This is what caused the national debts to increase, you will see everywhere, with individuals, that those debts keep growing,” Bernard explains as he details our current situation. He is correct, 8 people own more wealth than half the world and it is because the system they built is set up to funnel wealth upwards. These people robbing the masses with impunity is entirely possible, as Bernard explains, because they operate outside of normal laws. What Bernard is referring to in the quote above is illustrated on nearly a daily basis. We see bankers across the planet get exposed for funding terrorism, human trafficking, money laundering for drug cartels, and employing a scheme of wholesale robbery against the commoner. When these criminals are caught — and even admit to their crimes — they are let off with no accountability. Bernard then goes on to make a powerful yet ominous statement. When we look at the suffering of other human beings across the planet, we can link this back to a predatory state or elite entity immune from the rule of law through special privilege obtained through the state. While Bernard goes on to note that there is a single organization at the top running things, we feel that it is a little more complex. There are certainly power players who influence global policy, but there are constant rifts within these elite groups separated by different nationalities and cultures. However, that doesn’t change the nature of the effect — debt and suffering. This top-down model, as Bernard points out in the latter part of the interview, is “the ideal situation for psychopaths” because they get to prey on the masses using the power of the state. Most importantly, as Bernard points out, none of this will change as long as people are unaware of how it works. Even when people do become aware of the banking elite and their ability to rule from outside the law, they believe they can change it by acting within that system. This deception is maintained by instilling the illusion of democracy. But, like Bernard notes, that change never comes because the people who enter the system, even if they are originally genuine at heart, become puppets for the status quo. What Bernard is talking about is not some conspiracy theory. It is very real. As the Free Thought Project reported this week, in an interview with French publication Le Figaro, Russian President Vladimir Putin, noted this exact same thing when he said U.S. presidents serve as little more than puppets for the ruling oligarchy. “A certain person may be elected by the public on the basis of his merit and ideals – but rarely is this person able to formulate policy,” Putin said. While this situation may seem bleak on the surface, resistance is most assuredly not futile. The good news is that there is a solution to this madness and it is in the palm of your hand right now, or on the screen in front of you. Humanity has the ability to communicate with one another across the world — instantly. It is up to us how we choose to use this ability. Will we spend it staring at videos of kittens 24/7, or break away for a few moments to take in and disseminate information that will help to free our fellow human. Information and knowledge will free us from those who wish to keep us oppressed but only when we want to be free. This all starts with you. Below is the summary of Bernard’s interview and below that is the full interview.